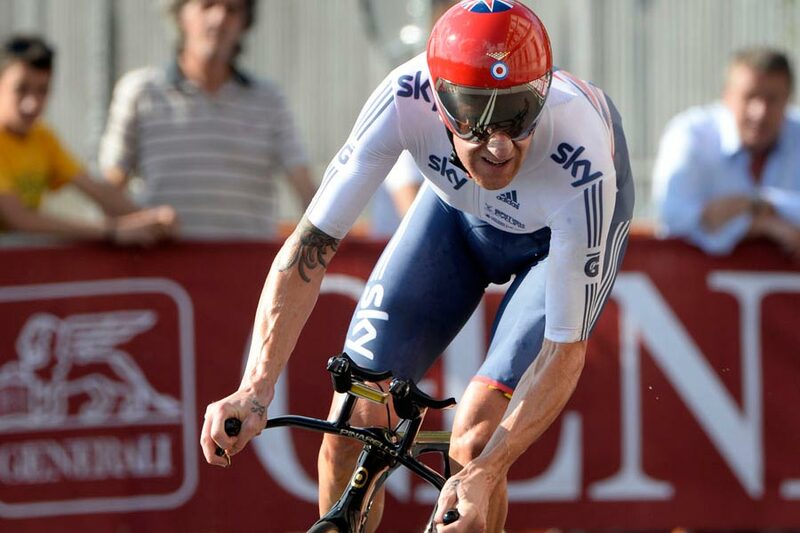 Olympic golds, a Tour win and world champion, Sir Bradley Wiggins has done it all. There aren’t many riders out there who have a palmarès that can compare to Wiggins’s, particularly with his successes both on the track and on the road. Now 36, Wiggins is about to hang his wheels up for good after a final year which saw him reunite with his track roots. But Sir Brad made a lot of history for Britain on the road, so here we take a look at the best of those moments. Wiggins’s first real showing of his Grand Tour potential came in 2009, riding for Garmin Slipstream at the Tour de France. He finished fourth originally, before being promoted to third after the disqualification of Lance Armstrong. A strong showing in the mountains was a sign of things to come, and the result made him the first British rider to finish on the podium at the world’s biggest bike race. A time trial win on stage one of the 2010 Giro d’Italia put Wiggins into the first Grand Tour leader’s jersey of his career. 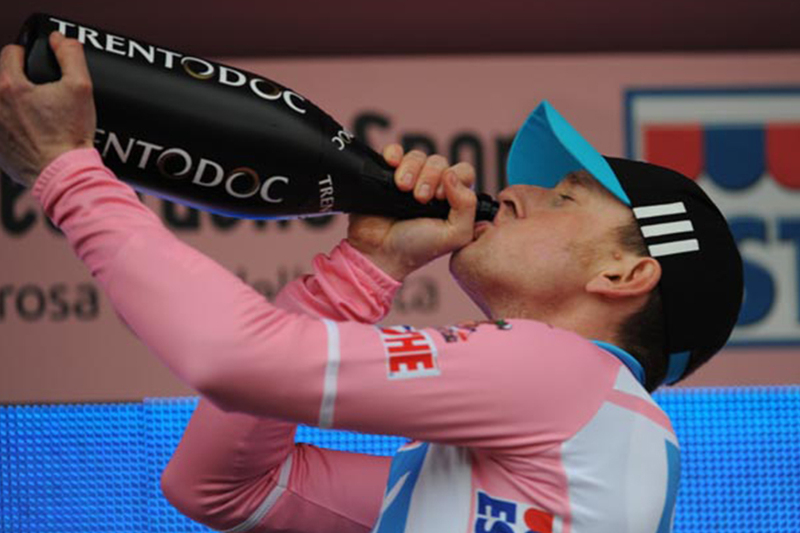 Though he only enjoyed the lead for one day, relinquishing the pink jersey to Cadel Evans after a crash on stage two, again it was a sign that Wiggins was able to cut it at Grand Tour level. It also took him one step towards becoming the second British rider to wear all three Grand Tour leader’s jerseys after David Millar. 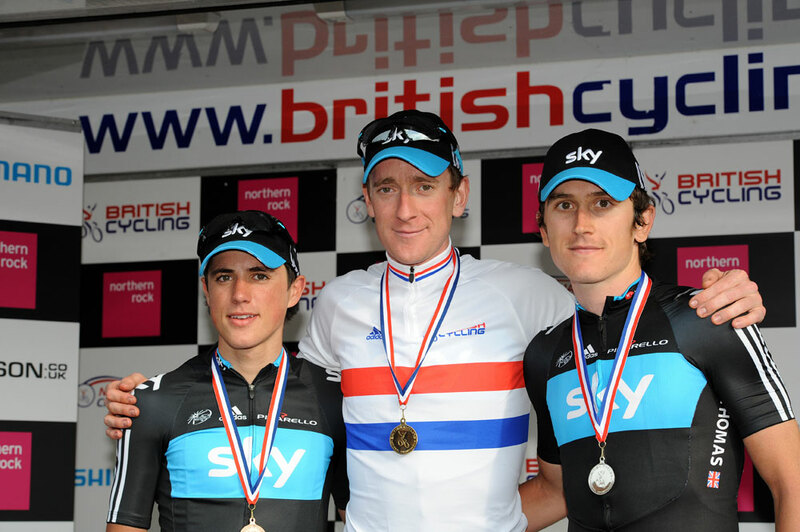 Wiggins was already a two-time British National Time Trial Champion by the time he won the road race national title in June 2011, ahead of Sky teammates Geraint Thomas and Peter Kennaugh. Earlier that same month Wiggins had taken a WorldTour overall victory at the Critérium du Dauphiné, the first of five stage race victories at that level in his career. Despite officially finishing third in the Tour de France in 2009, the 2011 Vuelta a España was the first time Wiggins was able to actually take to the podium at the end of a Grand Tour. 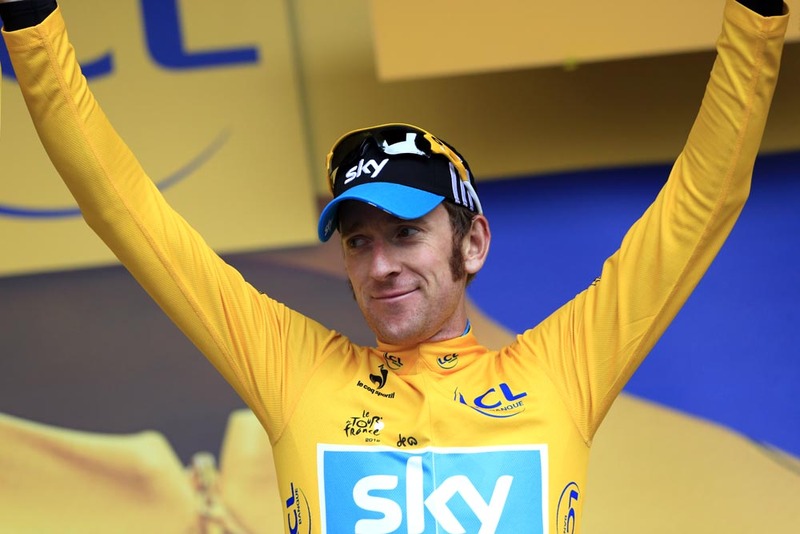 Wiggins led Team Sky into the final grand tour of the year and managed to hold the leader’s red jersey for four days. The steep ascents of the Angliru were too much for Wiggins though, and he fell behind eventual winner Juan José Cobo and teammate Chris Froome. But having crashed out of the Tour de France earlier that year with a broken collarbone, the Vuelta was vital preparation for any Grand Tour challenge Wiggins was to make in 2012. For all his GC glories, Wiggins was not one to win many road stages at cycling’s highest level, instead taking most of his advantage through time trials. So it was a bit of a surprise when he was able to find himself in a position to sprint for glory on the first stage of the 2012 Tour de Romandie. But he did it and he won, and it remains one of our personal favourite Wiggins moments for being so out of character. The crowning glory of Bradley Wiggins’s palmarès came in mid-2012 with overall victory in the biggest race of them all, the Tour de France. Wiggins’s year leading up to the Tour had contained a series of victories, taking the overall wins in Paris-Nice, the Tour de Romandie and again in the Critérium du Dauphiné to make him a hard man to bet against for the 2012 Tour. He remains the only rider in history to win all of those races in one year. He took over the race lead from Fabian Cancellara on stage seven of the Tour and never let go. Two time trial stage victories along the way cemented his lead until Paris, making history as the first British rider to take victory in the Tour de France. As though 2012 couldn’t get any better, Wiggins set out to win gold at the London Olympics in the individual time trial, just one week after the end of the Tour. He took victory over second place Tony Martin, who was the current world time trial champion, by 42 seconds on the 44km course, winning his seventh Olympic medal and his fourth gold. By the end of the year, it was announced that he would be knighted after his achievements on the bike. With standards set so high in 2012, Wiggins aimed to conquer the Giro d’Italia and ride the Tour in 2013, but abandoned the Italian race after stage 11. His form was certainly not what it had been the year before and he did not return to ride the Tour de France in 2013. A win at the Tour of Britain however, followed by a silver in the World Time Trial Championships ended the year on a positive note. 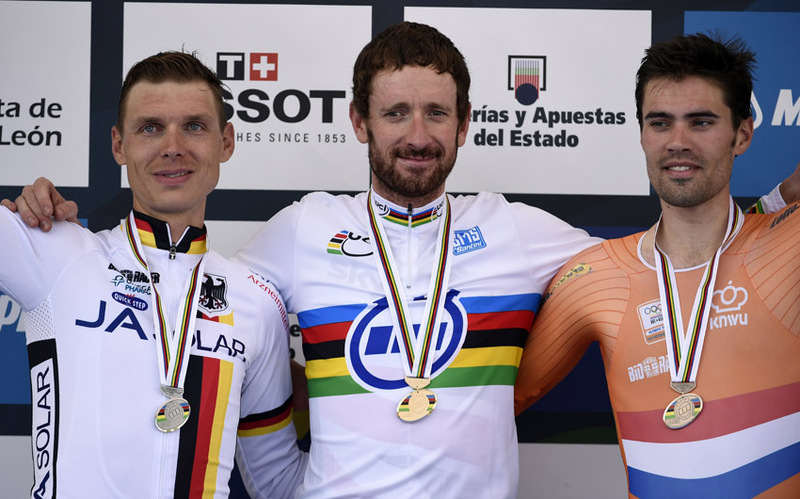 Having already been a world champion on the track, a rainbow jersey had always been just out of Wiggins’ grasp on the road. Ninth place in Paris-Roubaix and an overall victory in the Tour of California during 2014 were valuable results for Wiggins, but he had stated early on in the year that the world championships was his main target. Another National Time Trial Championship victory and time trial stage wins in the Tour of California and Tour of Britain were indicators that Sir Brad was in top form, while a technical and hilly course in Ponferrada suited him more than it did his main rival Martin. In the end, he beat the powerhouse German by over 26 seconds, becoming only the second British male to win the world title after Chris Boardman did it in 1994. The swansong race of Bradley Wiggins road career with Sky didn’t suffer from a lack of build-up. Fans and pundits alike dreamt and wrote about a final climax to Wiggins’s time in the WorldTour with a Tour de France winner taking victory on the cobbles of Paris-Roubaix. He tried, but it wasn’t meant to be, with Wiggins finishing the race in 18th. But his attack on sector seven through the dust and grime is one that many of us will remember.